In their quest to understand the origins of stars and galaxies in our universe, astrophysicists use supercomputers to model extremely complex phenomena on an immense scale. Massive stars 10-100 times more massive than our sun, are central to the key phenomena that shape the universe, but the processes involved in their formation remain elusive. 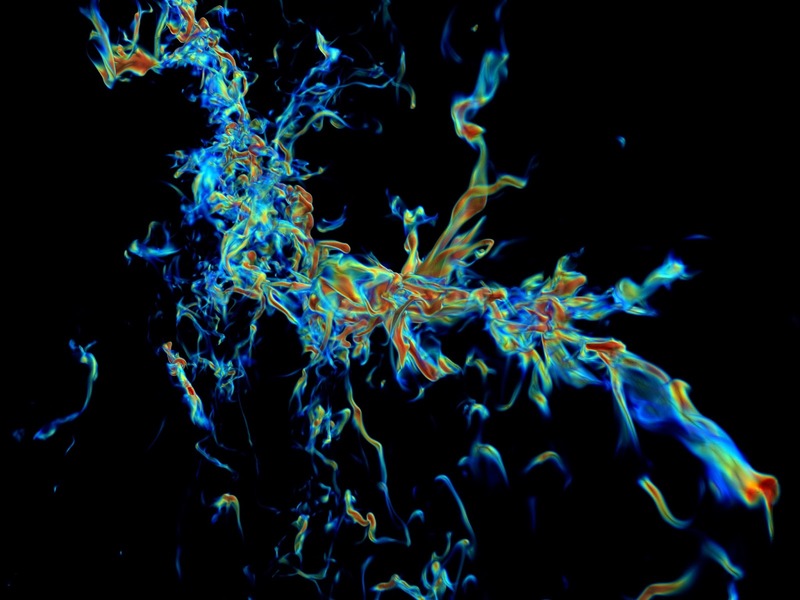 To investigate these processes, University of California-Berkeley researchers perform large-scale supercomputing simulations of massive stars forming from the collapse of giant, turbulent molecular clouds. In this image, a simulation shows the gas filaments that formed in an infrared dark cloud 800,000 years after the region began gravitational collapse. The extent of the main filament is about 4.5 parsecs in length. In the highest density fragments in the filament (red), molecular cloud cores are developing and will collapse further until they form stars. Each simulation in this project used 1,000 - 4,000 processors on the Pleiades supercomputer at the NASA Advanced Supercomputing (NAS) facility, for a total of 1 million processor-hours over several months of computation. Image credit: Richard Klein, Lawrence Livermore National Laboratory; Pak Shing Li, University of California, Berkeley; Tim Sandstrom, NASA Ames Research Cente.